The most complete information on GMDSS weather services will be found on the WMO/IMO Joint Commission for Oceanography and Marine Meteorology site. There are details of broadcast schedules, contact addresses etc. The quality of the presentation varies between the various responsible countries and areas. What is the future of the GMDSS? * 1960 - SOLAS IV came into force on 26 May 1965 and was the first major task for IMO after the Organization's creation. SOLAS IV represented a considerable step forward in modernizing regulations and in keeping pace with technical developments in the shipping industry. * 1974 - SOLAS V with a built in amendment procedure. An important feature of this process is that decisions have no longer to be ratified by a two thirds majority of members but come into force unless a sufficient number of objections have been received. Originally, SOLAS was concerned primarily with large vessels, usually defined as > 300 GRT. Over time, however, smaller vessels such as fishing boats and training yachts have been included. In 2002, the scope of SOLAS was extended to include leisure vessels > 8 metres LOA by noting that SOLAS Chapter V refers to the Safety of Navigation for all vessels at sea. REG'ULATION 19 - if practicable, a radar reflector is to be fitted. REGULATION 27 - nautical charts and nautical publications shall be adequate and up to date. REGULATION 28 - a log shall be kept. REGULATION 29 - an illustrated description of life-saving signals shall be readily available. REGULATION 31 and 32 - reporting of weather, wrecks and other objects that may be a hazard to navigation. REGULATION 33 - obligation to respond to a signal from any source that persons are in distress at sea. REGULATION 34 is, perhaps, the most significant to leisure sailors, and a source of some concern, in that it requires that an intended voyage should be "planned ..... taking into account all known navigational hazards and adverse weather conditions". The weather forecast and regular updates. Suitability of the boat, equipment and provisioning. Ability to navigate without GPS, should it fail. Ensure someone ashore knows your plans. First, there is the requirement laid upon co-operating Governments to monitor distress and other calls for help from vessels or persons at sea and to take action accordingly. This involves international and national coordination. Secondly, SOLAS places requirements on Governments both to warn of dangers and to ensure that, when intelligence of any dangers is received, from whatever reliable source, it shall be promptly brought to the knowledge of those concerned and communicated to other interested Governments. This involves the Marine Rescue and Coordination centres (MRCCs). Under SOLAS, contracting Governments undertake to encourage the collection of meteorological data by ships at sea and to arrange for their examination, dissemination and exchange in the manner most suitable for the purpose of aiding navigation. This includes warnings of gales, storms and tropical cyclones using appropriate shore-based facilities for terrestrial and space radio communications services. By implication, this includes the provision of forecasts of hazardous weather, sea and ice conditions. There is a formal requirement to broadcast weather information, at least twice daily. This has to be suitable for shipping and contain data, analyses, warnings and forecasts of weather, waves and ice. The information should be transmitted in text and, as far as practicable, in graphic form including meteorological analysis and prognosis charts transmitted by facsimile or in digital form for reconstitution on board the ship's data processing system. Where practicable, daily weather charts should be available for the information of departing ships. This comes under the surveillance of a Joint Commission for Oceanography and Marine Meteorology reporting to the World Meteorological Organisation and the International Maritime Origination. 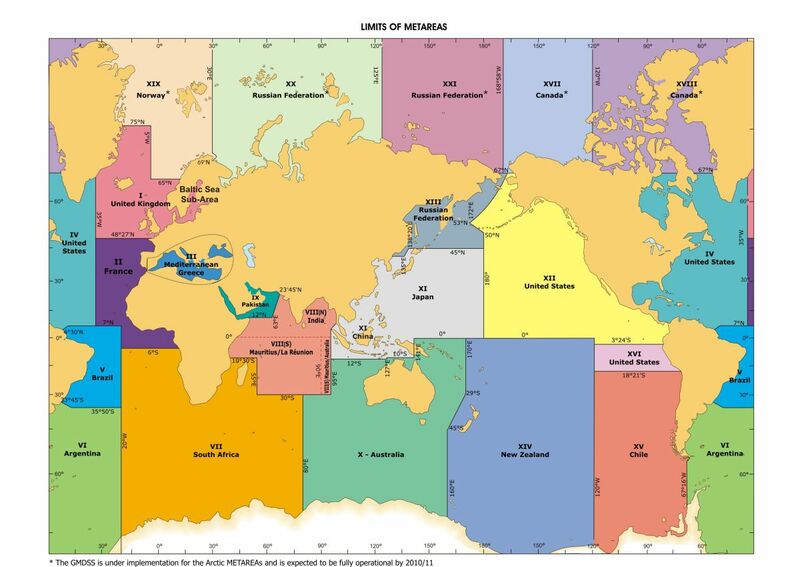 Under JCOMM, the world is divided into METAREAS (aligned with NAVAREAS). One or more countries accept responsibility to coordinate marine weather services for each area. High Seas forecasts (Bulletins au grand large in French) that cover the large areas and intended for use by vessels on ocean crossings. These are normally issued twice a day via the Inmarsat SafetynetTM and/or by HF/SSB broadcast. Warnings for these areas are usually restricted to Storm force 10 and above. Shipping Forecasts (Bulletins au large in French.) intended for vessels making coastal or sea passages. Warnings are given for Gale force 8 and above but may include Near Gale force 7, thunderstorms and fog. Broadcasts can be one or more of VHF, MF/SSB and the international NAVTEX frequency of 518 kHz. Inshore waters forecasts (Bulletins Coti�re in French) intended for small vessels within 10 to 20 nautical miles of the coast. Warning criteria may be as low as Strong Breeze force 6. Usually, these will be broadcast on VHF. Occasionally, eg the UK, the national NAVTEX frequency of 490 kHz. Times of issue are generally 12 hourly for the High Seas but other forecasts vary greatly from country to country. Best practice is followed by the UK and Ireland who update their Inshore Waters forecasts 6 hourly. SOLAS requests nations to issue forecasts in graphical form where possible. Currently, this is mainly by Radiofax transmissions on HF/SSB. The Deutscher Wetterdienst provides a comprehensive Radiofax service for Europe These and other details can be seen on thr WMO website page WMO/OMM No. 9 WEATHER REPORTING MESSAGES M�T�OROLOGIQUES. Several components of the GMDSS are �old technology� that dates back to the 1950s and is narrowband as is the newest component, Inmarsat-C. Nowadays, most forecasts that are broadcast via the GMDSS are also available on the Internet. However, for reasons discussed on my GMDSS Future page the Internet cannot be regarded as a GMDSS replacement. In any case, the GMDSS is about safety information in general and not just weather. This raises the question of what next and when.